The internet is a busy place. As a developer you need to check a lot of services to know what’s going on with your teams. Has anyone pushed new changes to my repositories? Did my boss enter any new tasks for me? Have my latest changes broken the build? Keeping up to date is time consuming. Wouldn’t it be great to see all your updates on a single feed? We thought so. Yesterday we released teowaki’s webhooks. You can listen to events happening elsewhere in the internet and show them in your team stream. Click on an event to see the details or navigate directly to the page where the event happened. You can even use teowaki’s to search through your received webhooks. Go to your project settings and navigate to the Settings menu. 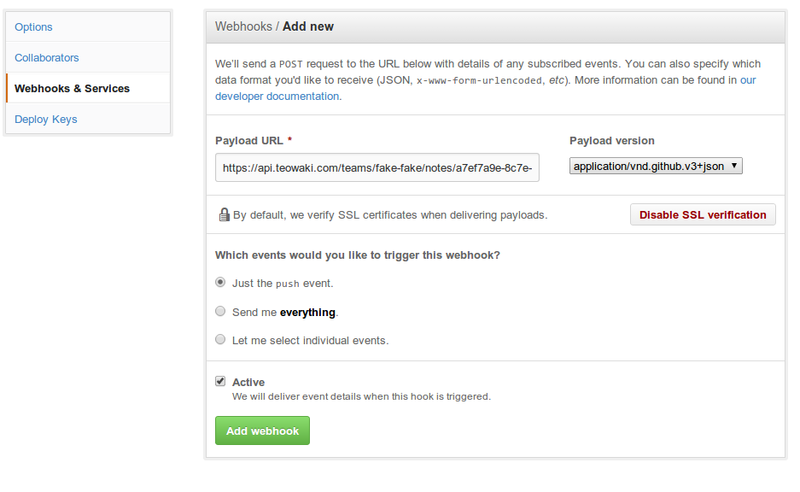 Select the Webhooks & Services option and simply paste your teowaki’s secret URL into the Payload URL input box*. Click on the Settings icon of your project and then select the Hooks option. From the dropdown list of integrations choose POST and simply paste your teowaki’s secret URL into the URL input box. Select Configure integrations from the Project menu. 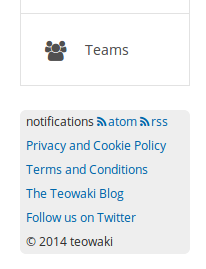 Scroll down to the Activity Web Hook section and simply paste your teowaki’s secret URL into the input box. If you want to send webhooks into your project from any other service, all you need to do is POST a XML, JSON or x-www-form-urlencoded request to your secret endpoint. The POST should include at least a field called name and a field called description. You can also send a field called url and a field called origin_name. As long as your POST contains those field, teowaki will display the information into your team stream. The use cases for custom webhooks are endless. As an idea, you can send webhooks from scripts running in your servers every time a new version is deployed or a service is restarted. Everybody in your team will receive the notification on teowaki. We are already working on integrations for Jira and Trello. 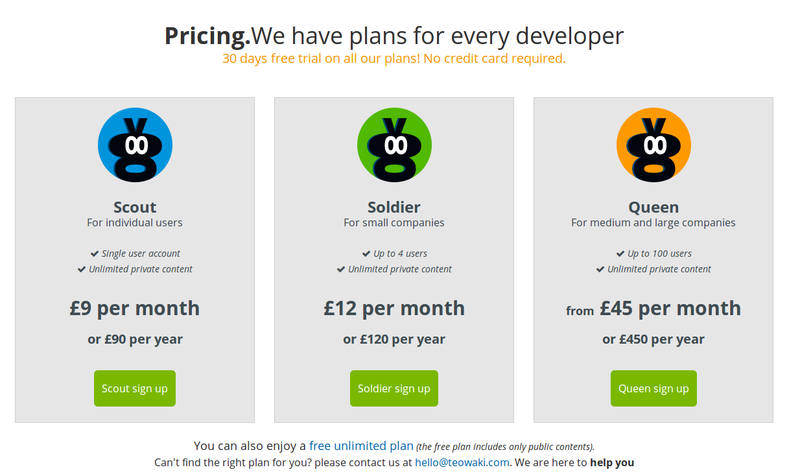 We will keep adding new services we think are interesting for developers. If you are using teowaki and you are missing any integrations, please let us know. Time flies when you are having fun. It’s been already one month since we announced our public launch and we have been busy adding a lot of small things to make teowaki even better for you. After our Xmas break, we started the year by improving our search engine and adding individual pages for links, shouts and jesters. 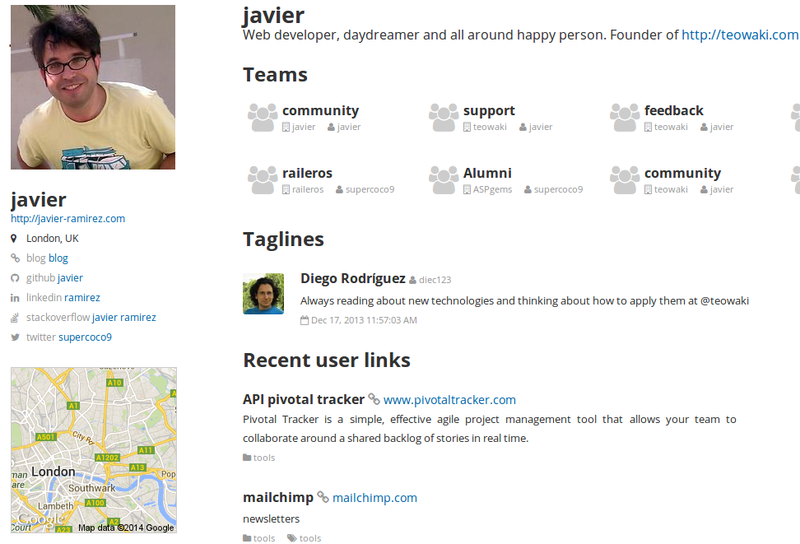 Then we added the “personas” feature to your profile, so you can let everybody know your different online identities. In the meantime, we got the opportunity to speak at local communities of developers in Zaragoza and London, sharing with them the technologies we are using at teowaki. And today we are proud to announce our first geolocation features. 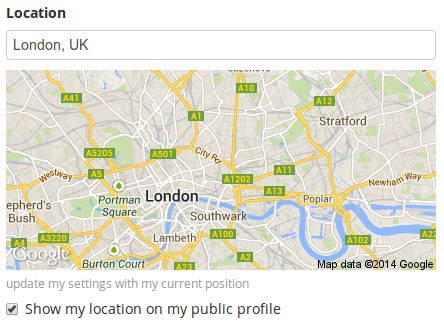 You can now add your location to your profile, so other users can see where you are based. This is the cornerstone for the rest of our geospatial functionalities. In a few weeks you will be able to filter your search results by proximity —search for people or teams close to you— or to send shouts to users around one area. When you visit your profile settings, your browser will ask for permission to use your computer’s location. Unless you allow your browser to pass your information to teowaki, we won’t be able to guess your current city and country automatically. Once you allow us to guess your location, teowaki will show your position on a map. In the rare cases where we can’t automatically locate you, or if our location is wrong, you can enter your city and country in the location text box and we will map it. Even if you want us to keep your location, so we can use it for proximity searches, you can still uncheck the option to share your location publicly. In that case, we will store your location in our servers and we will use it internally, but we will never disclose your location to other uses. You can switch this check on and off as many times as you want. You are in total control of what and when it is shared about you. Don’t forget to use the “Update” button to save your settings. Once you enter your location and give your permission, the name of your base location and a small map will be displayed on your profile. * our analytics backend uses techniques for geolocating every request we get to the system by analyzing the IP address. This is done at as a separate process and we don’t associate this information to your user, just anonymously to every request that hits our servers for statistical purposes. Back in November, we invited 50 of our developer friends to try the alpha version of teowaki. We have learned a lot from them (thank you all! ), we have improved the tool in the last few weeks, and we are ready now for the big opening. Our mission is to make you happier and to help you stay in contact with your friends and colleagues no matter where you are. Please start using teowaki, invite your developer friends to your teams, and let us know how we can make teowaki better for you. You might be wondering what kind of things you can share with other developers at teowaki, and the answer is pretty much anything that makes sense for you. 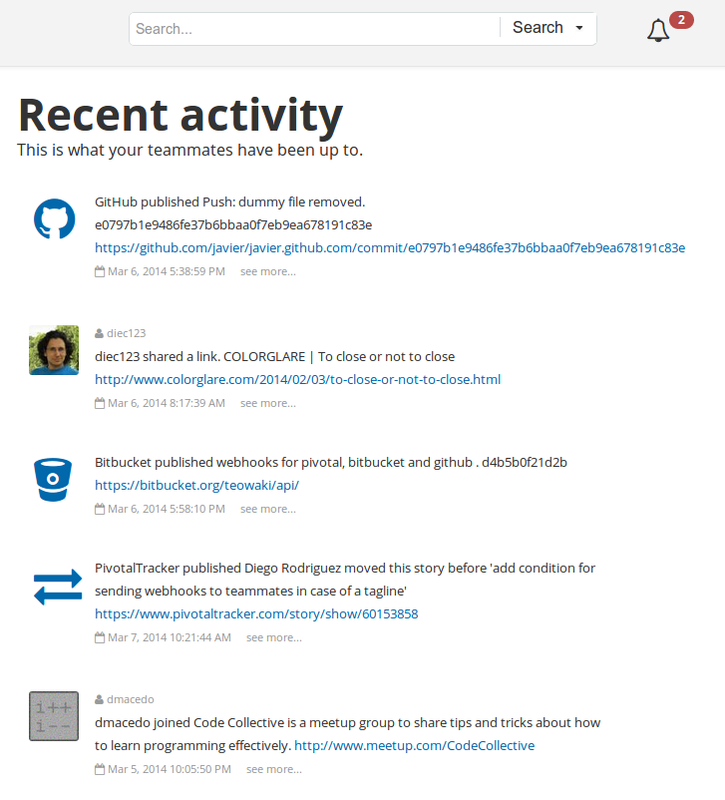 As an example, we at teowaki are using the site for sharing interesting links about software development, tools we like, distributed systems, news, or just for fun. We also share our best practices and code snippets, and even the methodologies we use. When we publish something that doesn’t need to last for long, we just set an expiration date and forget about it. We have also created a team for getting feedback from our users and we use private teams for talking about development issues, telling jokes, publishing mistakes we have made or keeping track of interesting events. At the moment teowaki allows you to share links, best practices, shouts (short messages), jesters (mistakes) and, of course, your profile. You can share information privately or publicly, with just one team or with as many as you like. You can search for public contents from other users and fork them into your teams, so you don’t need to start writing from scratch. You can join as many teams as you want, so you can communicate at the same time with your colleagues, the customers you are freelancing for, your friends from Uni, the members of your local communities, or the delegates to that conference you attended last summer. Because we don’t think it’s fair you have to stop sharing valuable information with interesting developers only because you quit a job, or you live in a different city or you can’t find the time for meeting regularly. 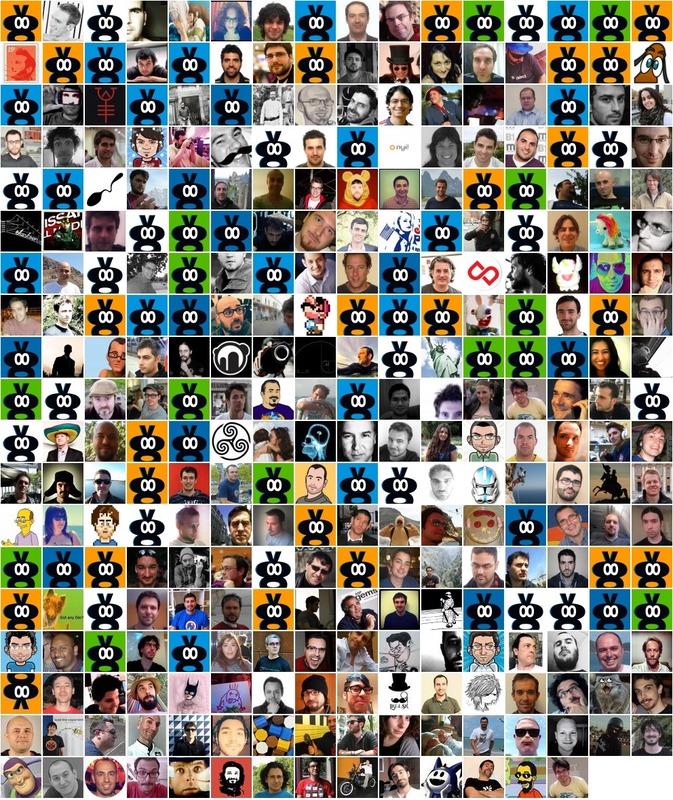 User profiles are another interesting feature. No matter if you change teams or companies in the future, your URL will always stay with you. You can go by different nicknames when joining different teams and if you want to keep a particular membership secret, you only need to go to your settings and mark that team as hidden. You know, sometimes your boss doesn’t need to know you are freelancing for other people. If you are an event organizer, teowaki gives you a free backchannel for you to use before, during and after the events. Let event participants curate link lists, have conversations, and extend the reach of your event. Have separate teams for volunteers, organizers, speakers and delegates if you want. Provide a single URL where everybody can keep up to date with the news, so you can enjoy more free time for making your event awesome. We are just providing the channel, but we are keen to see how you all are going to use it and we are looking forward to learning from you and making a site where developers feel at home.